This beautiful discovery game will open up a whole new world of understanding for you and everyone you share it with. There is never a time in life when knowing yourself better is not valuable. Never played with Satori Cards before? 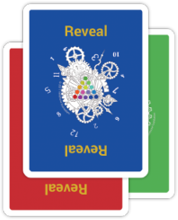 Begin Revealing Time by using the Reveal Cards to reveal the patterns of time, just follow the simple instructions below. And then after you’ve revealed time, you can reveal your thinking style with the Satori Cards. 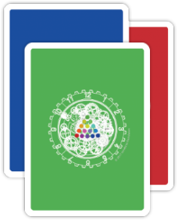 Further down the page you’ll find what you can do with the Satori Cards after you’ve revealed your own thinking style, like how to improve communication with your boss or how to use the cards with your partner. Take your 9 Reveal cards, shuffle them and hold them word-side facing you. Without looking at the coloured side of the cards, arrange the 9 words into 3 groups of 3 cards. The words in each group should resonate, not because they are part of a sequence, but because they express the same intention or point of view. When you are satisfied with your 3 groups, turn the cards over. You should find you have 3 groups of the same-coloured cards. Don’t worry if you don’t get it the first time. It’s not important. The idea here is to develop your awareness of how words reflect time’s patterns. If you did not group them this way, have a look at the cards you didn’t place correctly. Can you now see the patterns? Find your 45 Satori cards and shuffle them well. Hold the cards word side facing you. a NO pile for the rest. The more clearly you can reflect the truth of your behaviours in your choosing of words, the more powerfully this mirror will reflect you and reveal your patterns of thought. This is not about how you wish to be or what you think is right. There are no better or worse results. Just be yourself. Pick up your YES pile and discard your NO pile. If you have more than 12 cards in your hand (most people do), spread all your YES cards out in front of you. From these choose the 6 words that most clearly describe your thoughts and behaviours. Put these words in a row in front of you. Now choose the next 6 words and make a second row. When you’re happy with your final 12 cards, discard the rest. Now, turn your chosen cards over. The combination of colours you see represents your blend of the 3 perspectives. The fastest way to calculate your archetype is to use our simple online archetype calculator. You can also calculate your thinking style manually. Game 1 – The straight forward game described in the Basic Game. Game 2 – Know your limits and resistances. This game is designed to help you overcome your thinking resistances in order to be able to be more at home in the world by designing strategies that work for you around things that you would normally resist (the Connector archetype, also known as Integrated thinkers, do not have a resistance per se, they normally need to investigate how they lead with one perspective over the others when necessary. In this game you take the NO pile of cards from the first sorting you do as described in the Basic Game, and you then select 12 cards which are the 12 words you most resist (DO NOT identify with at all). Use these to learn what thinking perspective you resist and ask yourself where this resistance comes from, what is it about, is it in all things or only certain kinds of activities? Investigate the questions that arise for you when playing this game. Game 3 – What is your middle ground? These are the cards you selected into your YES pile but did not make it into the final 12 cards you choose as your archetype. These represent your range of comfort zone, your YES being one end and these middle cards the other end of your comfort zone. Your resistance cards are outside your comfort zone, obviously. Game 4 – Can you think of another one? We are going to be posting these on our new membership site and Instagram soon. You can play a hand of cards about a third person who is not present with you, like your boss or a potential partner (business or otherwise). This will allow you to better understand how to communicate with them. Think about them and what you know of them as you select 12 cards based on how they show up in the world (what you notice most about them). Calculate their archetype by using the online calculator or calculate them manually, and then when you communicate with them use words that are written on the cards and on their archetype card (one of your tools in the Satori Box). You can also think about an audience of people (such as a group you might belong to or an audience you might have to address), and play the same game about the culture of this group. Use the outcome to better understand, for example, a potential client and make better sales presentations. You can also play with another person. This works best if you have 2 decks. Satori Cards are a very good relationship game and there are several things you can do in a 2 people game. You can look at each other’s hands as you play your own hand in the normal way. You can play a hand about each other (your perceptions and perspective on that person and their perceptions of you). You can play a game where you identify your own resistances (as above) which makes for some very valuable learning when shared with the other person. To do this take your NO pile of cards from the Revealing Your Thinking Style Instructions and select 12 of these that you most resist. Now show them to your partner or co-player. Make sure to play this in a setting when both partners feel safe and be respectful of what comes up for both people.